During the pre-Brexit Mayfair property boom Claude Bosi decided to sell the lease for his two-star restaurant Hibiscus on Maddox Street when he was able to secure a good deal. And so Hibiscus closed its doors in October 2016 after 16 years, of which 9 years in London. In April 2017 Claude Bosi (b.1972 in Lyon) re-emerged with a new restaurant on 81 Fulham Road, better known as Michelin House. Michelin House is one of London's landmark buildings, renowned for being Michelin UK's former headquarters (from 1911 to 1985), with large stained glass windows featuring Bibendum, the Michelin man. 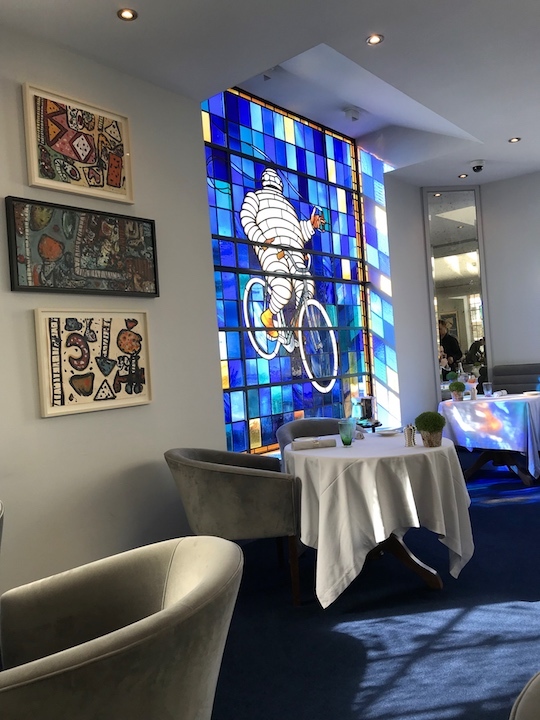 It is equally renowned however, for being the home of the Bibendum restaurant, most famously during the Simon Hopkinson years from the opening in 1987 until his departure in 1994. This new venture is a partnership between Claude Bosi and the owners of the building, Terence Conran and the Hamlyn family (heirs of publisher and philanthropist Paul Hamlyn), and the restaurant is called Claude Bosi at Bibendum ("Bibendum"). 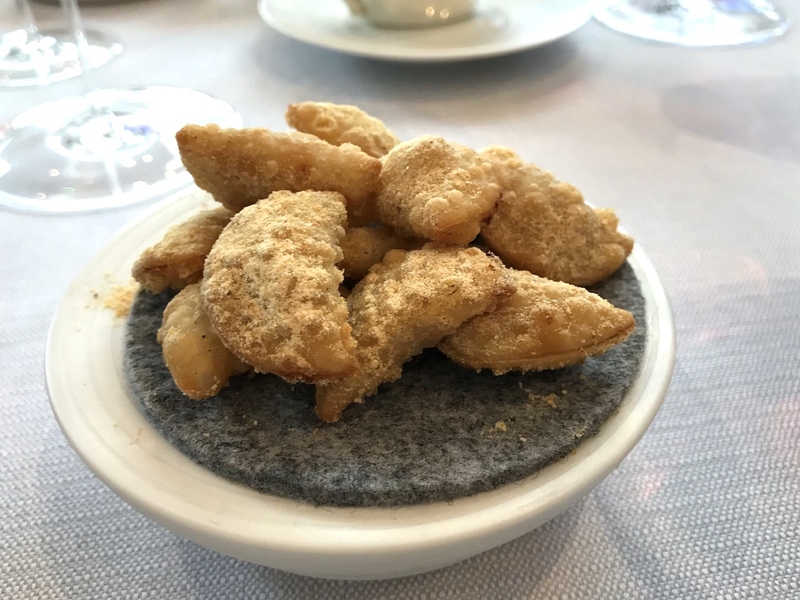 A French chef who has lived in the UK for two decades, who has has earned his Michelin spurs with two stars at Hibiscus for many years, and who reopens a restaurant called Bibendum in the Michelin house, was there ever a better match? 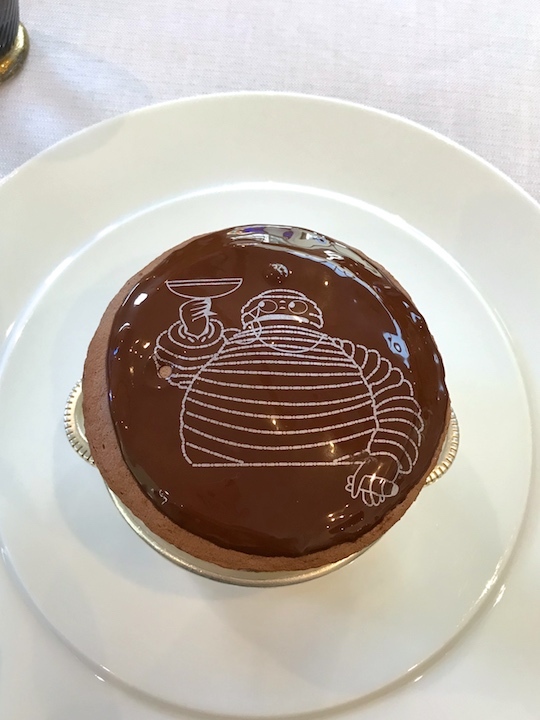 Michelin seems to have been absolutely delighted and they instantly awarded Bibendum 2 Michelin stars in the 2018 guide for Great Britain & Ireland, saying "food fit for this iconic building" in a tweet on the day of the release. Lunch started with a nice selection of nibbles, including some chicken skin scratchings served with a delicious chicken mayonnaise, cheese gougeres, and "olives" with a thin cocoa butter casing and a liquid apple juice and horseradish filling. 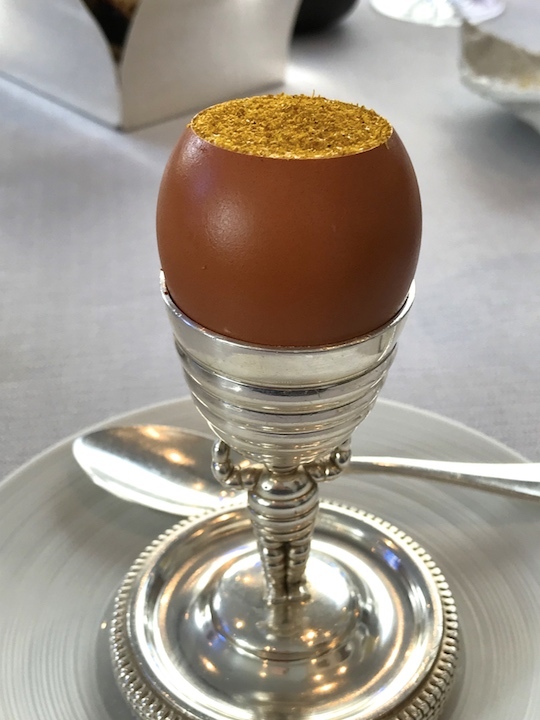 Next we were served a pretty little cornet with mango ice cream, foie gras crème and cocoa nibs, followed by an egg shell filled with an intense and rich mushroom crème, topped with a light coconut foam and dusted with curry powder, attractively presented in a beautiful silver Bibendum egg cup. A gorgeous and harmonious pairing, like a very refined mushroom curry. 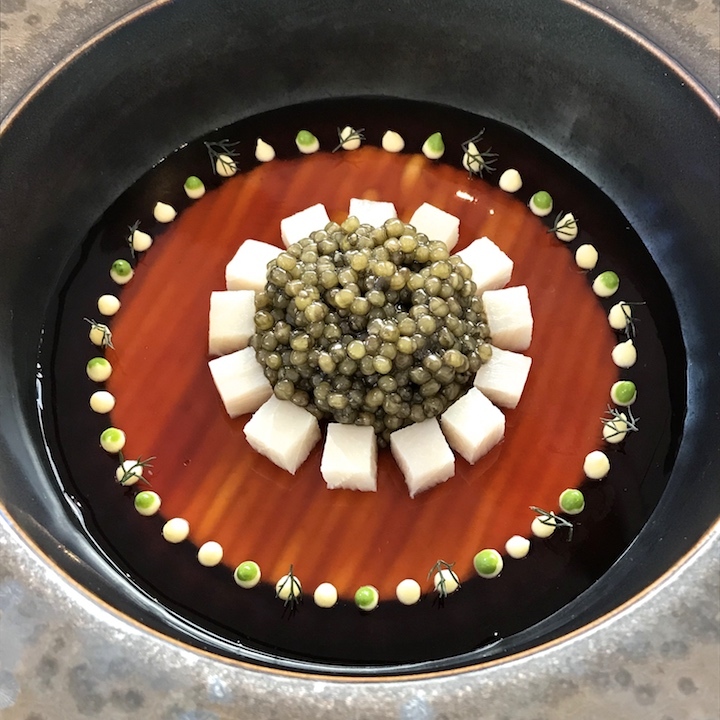 My starter today was a visually stunning dish of a luxurious and creamy sturgeon mousse covered with a thin layer of perfectly clear duck consommé jelly, and carefully placed in the middle was a little mountain of Oscietra caviar, surrounded by little cubes of smoked sturgeon. A sensational dish, precisely executed and with exquisite flavours. The sturgeon mousse had a delightful, smooth texture and its creaminess went incredibly well with the complex tasting duck jelly, which had a great, meaty depth of flavour, with a wonderful savoury sweetness and the mildest hint of orange. Loved the mouthfeel of the combination of the mousse and the jelly and the caviar delivered an extra texture dimension and a salty, lasting finish. The extra course was served right before the main course, a tasting menu portion of the à la carte dish "Scottish lobster with "Singaporean" pepper sauce". The tender lobster body meat was coated with a caramelly and umami-rich Singaporean pepper sauce, that had a well-judged spiciness to it. Also on the plate were some pickled vegetables, and a few dots of yuzu gel. The leg meat had been used for French-style barbajuan fritters, which were served on the side. 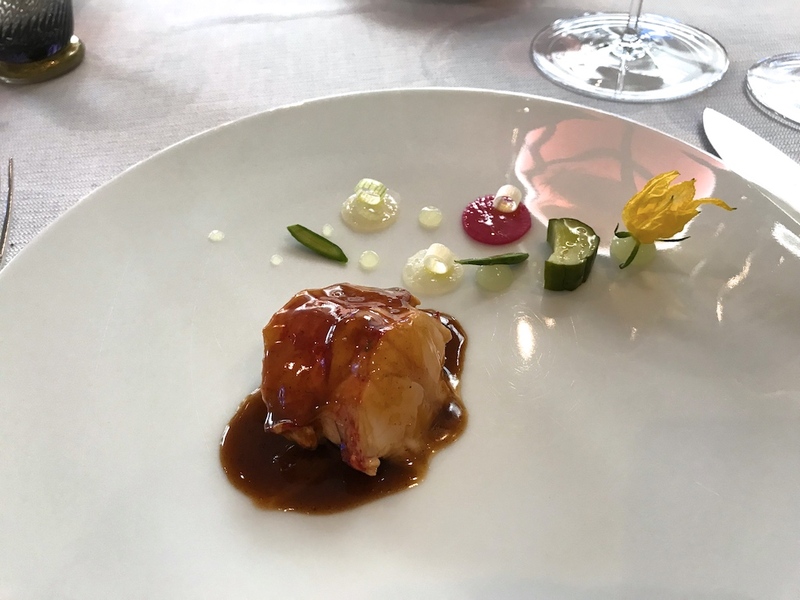 A textbook Bosi dish, all flavours blazing, the lobster handling the Singaporean pepper sauce beautifully, and the pickled vegetables and yuzu gel lending just the right touch of balance and freshness. The fritters on the other hand were pleasing, but I'm not sure if they added something to the dish. Dish of the day, though, was my main course of rabbit (saddle and leg) and langoustines, complemented by a highly decadent langoustine bisque sauce and a concentrated rabbit jus, and accompanied by artichokes à la Barigoule, and compressed apple flavoured with tarragon oil, the latter garnished with fresh sorrel and tarragon. Served on the side was a piece of crisp toast with langoustines and a spread of the rabbit's offal (liver, kidney and heart). Superb, skillfully cooked rabbit, the saddle divided in three immaculate pieces of loin and two rosy pink racks, but just as impressive was the beautiful preparation of the leg meat (the larger piece in the photograph). 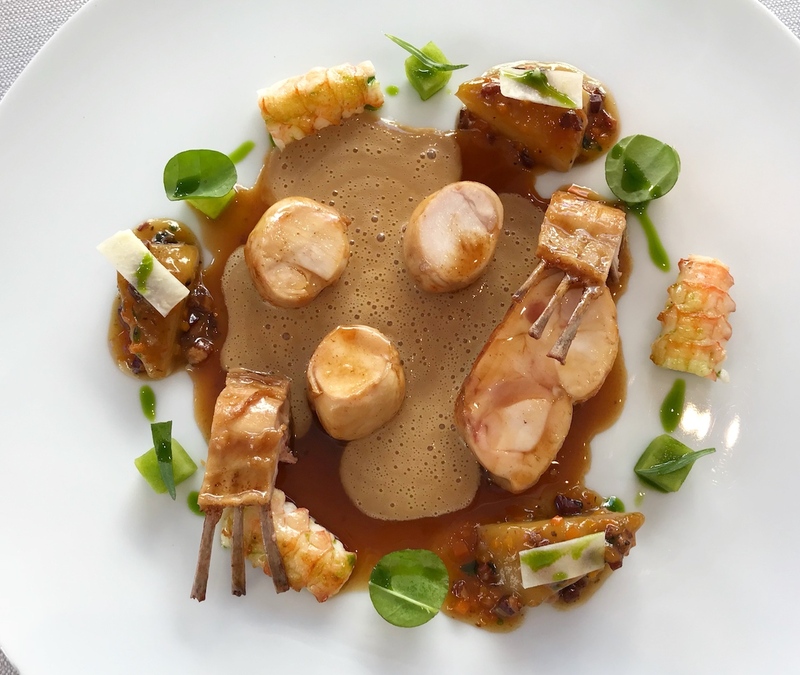 The taste of the rabbit was magnificent, mildly gamey, and with gorgeous roasting flavours, and the combination with sauce and langoustines made for an exceptional and lavish flavour experience. The pairing with the Provençal artichokes Barigoule worked equally well, the artichoke's sweet smokiness intensifying the natural flavours of the rabbit and langoustine. Simply a faultless and dazzling dish, executed with meticulous precision. Time for dessert. Even before entering the restaurant I had already decided to go for Bibendum's chocolate soufflé, but the dessert menu also featured an intriguing "Cep vacherin, banana, crème fraîche" dessert, so we ordered one to share. 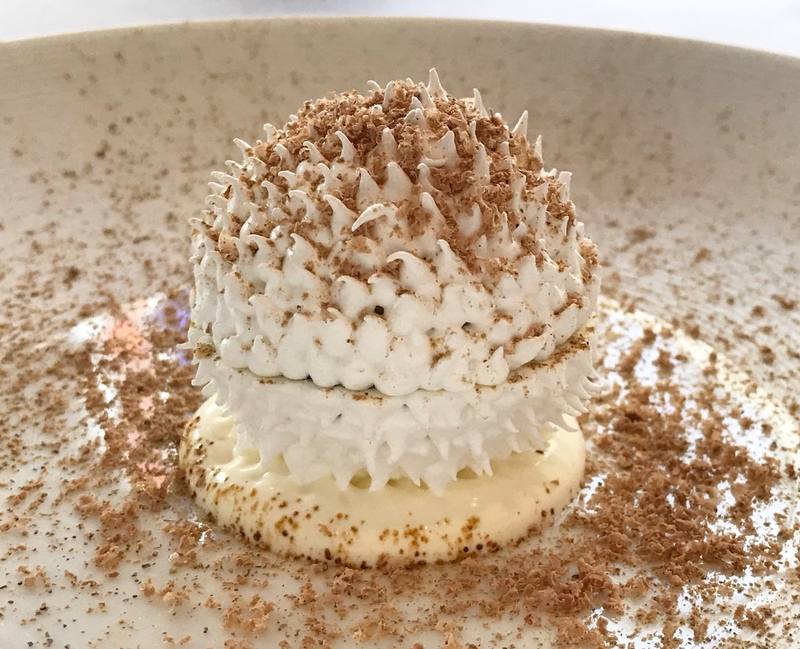 Vacherin refers here to the classic French dessert of meringue filled with ice cream, but the name is also a reference to the Swiss cheese, which the original recipe is thought to resemble. 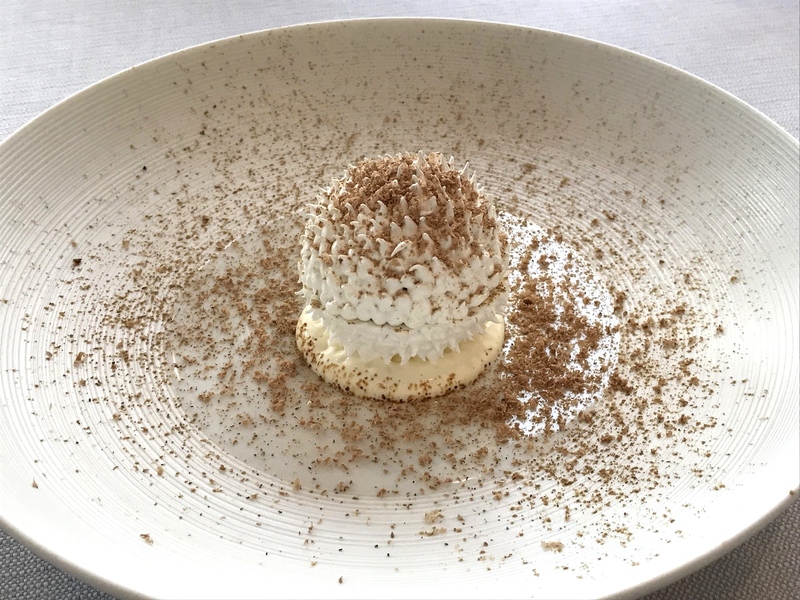 This dessert was comprised of two perfectly piped meringue halves with a banana ice cream centre, placed on some crème fraîche, and finished with cep powder and grated truffle. A pleasing and intricate combination of savoury-sweet flavours and the banana worked well with the coffee-like flavours of the ceps. 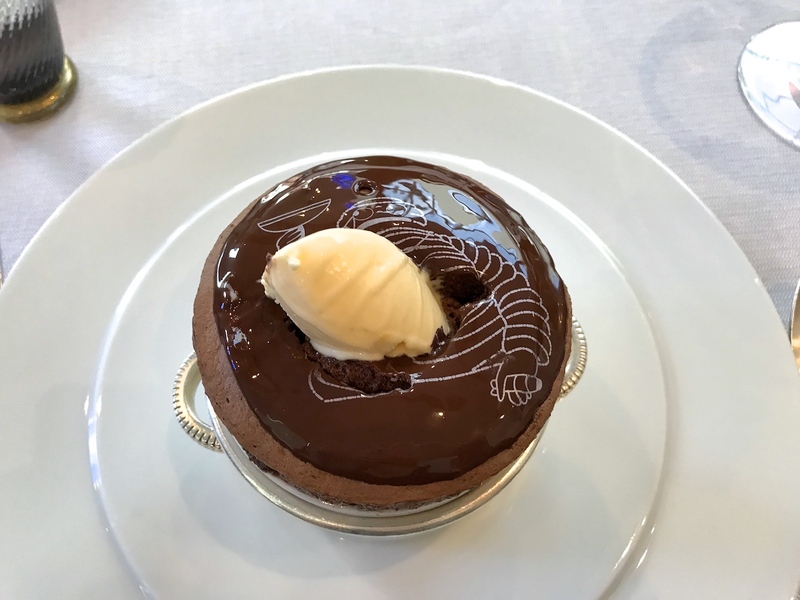 The real showstopper, however, was the chocolate soufflé, its surface glazed with shiny chocolate "stamped" with Bibendum and served with Indonisan basil ice cream. A glorious and exemplary soufflé, and right at home in this restaurant. Claude Bosi has emerged victorious with Bibendum. The building alone is a great reason to visit, but the most exciting thing about Bibendum is Claude Bosi's cooking. 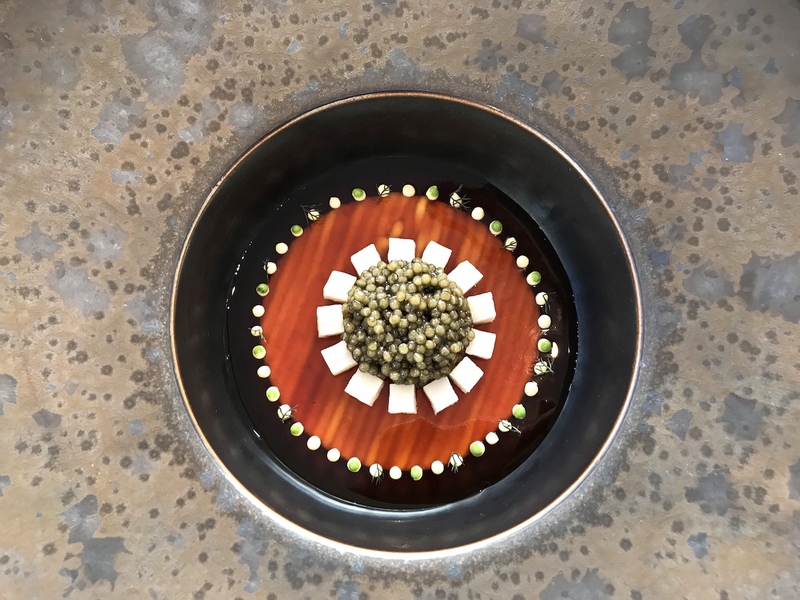 I think it was in June 2016, a couple of months before the closure of Hibiscus, that Bosi posted a video on Instagram of him setting fire to a tasting menu, with the accompanying text: "That's it the tasting menu only its finished we tried and didn't like it...!! back to the old 3course as well as tasting menu to give back the choice to the customer". Bibendum now offers exactly that, and mon Dieu, does he give choice to the customer with his à la carte menu, from the extremely elegant duck jelly and caviar dish, to my table companion's satisfying and refined tripe and cuttlefish gratin with pig's ear and ham cake. 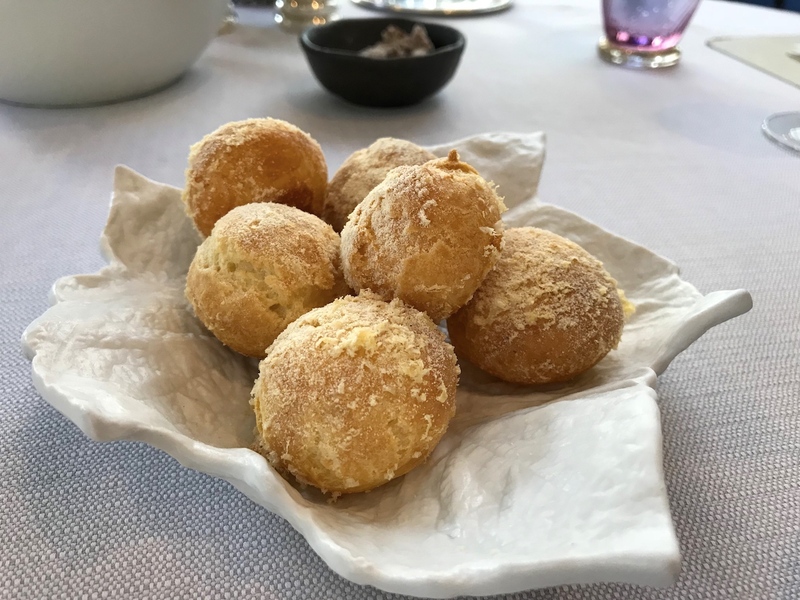 Claude Bosi is a chef of outstanding skill, his distinctive dishes centering around top-quality ingredients, and I'm pleased to see the flavours are still unapologetically grand and irresistible. I have enjoyed several wonderful tasting menus at Hibiscus, but after this meal I believe that in the end, his cooking is better suited for à la carte. 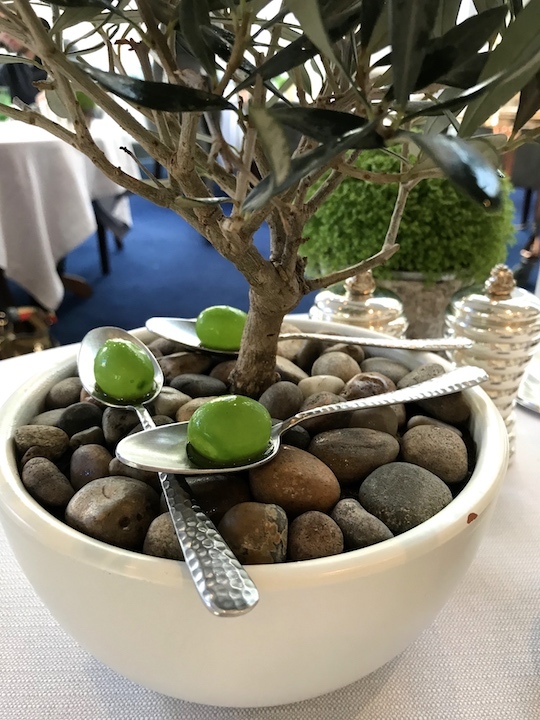 Today's dishes delivered an exceptionally intense and full-bodied experience, the à la carte portion size giving a quadruple hit to the senses. Personally, I would ditch the tasting menu altogether. Could the greatness of the Brittany rabbit be expressed in any other way than in a full-blown à la carte portion? A breathtaking dish that could easily be served in a 3-star restaurant in Paris, and the same goes for the duck jelly starter, by the way. 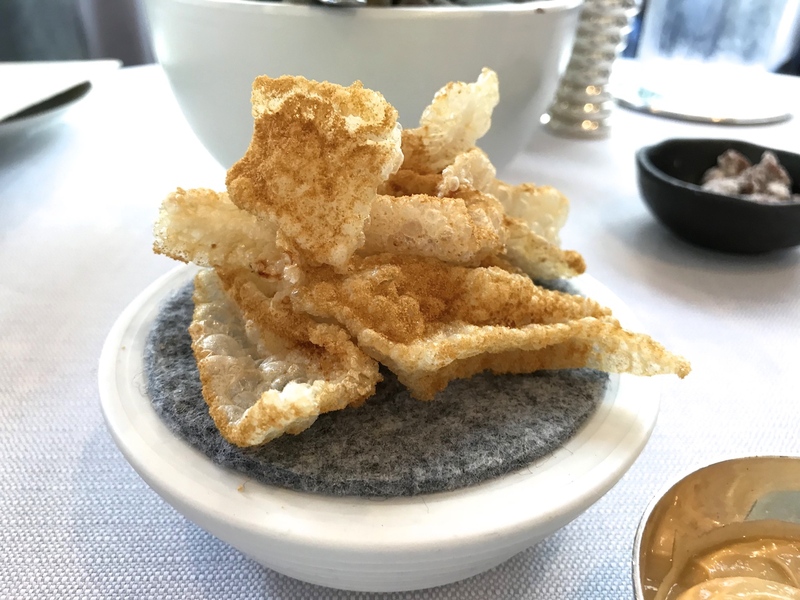 Bibendum's brand-new two-star accolade is more than deserved, but I do hope that the "oh this tripe isn't two-star worthy" crowd, which the restaurant will no doubt attract, does not affect the style and spirit which Claude Bosi is imparting on Bibendum. And I strongly believe there is even more to come.